Russia and Ukraine have been going at it on a variety of fronts in the last few years. This is no secret and easy to understand. Whenever an ex-Soviet satellite state which has long been an assumed possession of Moscow tries to move West and distance itself from its historical master friction ensues, to put it lightly. Last week Ukraine tried to highlight one critical angle to their dispute with Russia by making public statements to the effect that Russia is trying to annex the Kerch Strait (which of course, Russia denied as a matter of reflex). That the Kerch Strait has been under dispute for years is not news to anyone who has been watching, so why would the Ukrainian Foreign Ministry suddenly point out this particular issue among so many others at this particular time? to the Don River (by Rostov-on-Don), Sea of Azov, Black Sea and Mediterranean Sea. 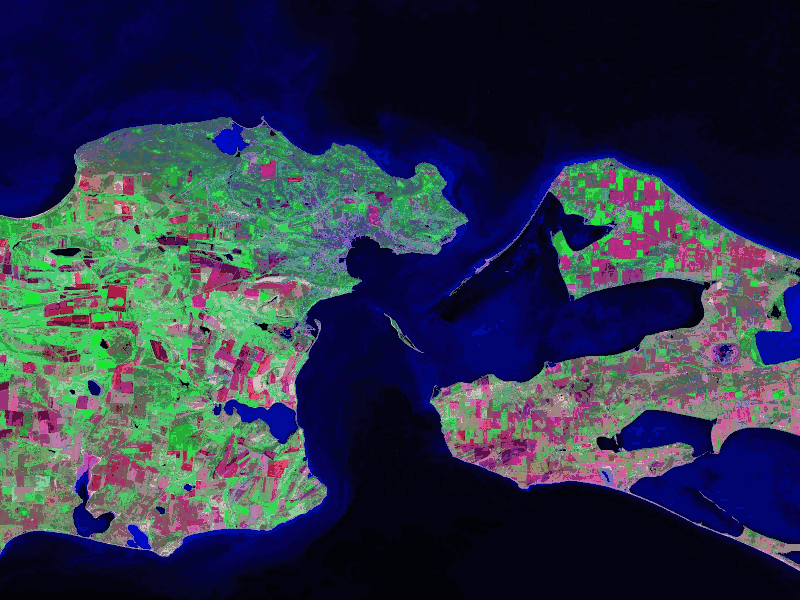 The Kerch Strait sits at the mouth of the Sea of Azov and forms a strategic chokepoint only a few miles wide between it and the Black Sea. It is a miniature version of the Bosporus which similarly separates the Mediterranean and Black Seas and is squarely controlled by Turkey (a NATO member) according to international law. The Russians are concerned about the Bosporus, an naturally so, as it is the gateway to their soft underbelly. But it is controlled by Turkey and anything outside of a shooting war is not going to change that. So they have to back their focus up to the Kerch Strait, which is the gateway to the Don River, which splits Russia’s western territory in half. If Ukraine were to assert any sort of dominant control over it, or even succeed in declaring that the international border runs directly down the middle of the strait, that still leaves about four miles of nautical highway controlledby Ukraine which could be used to shuttle hostile warships into the Sea of Azov, making any defense of south-central Russia a sudden problem. 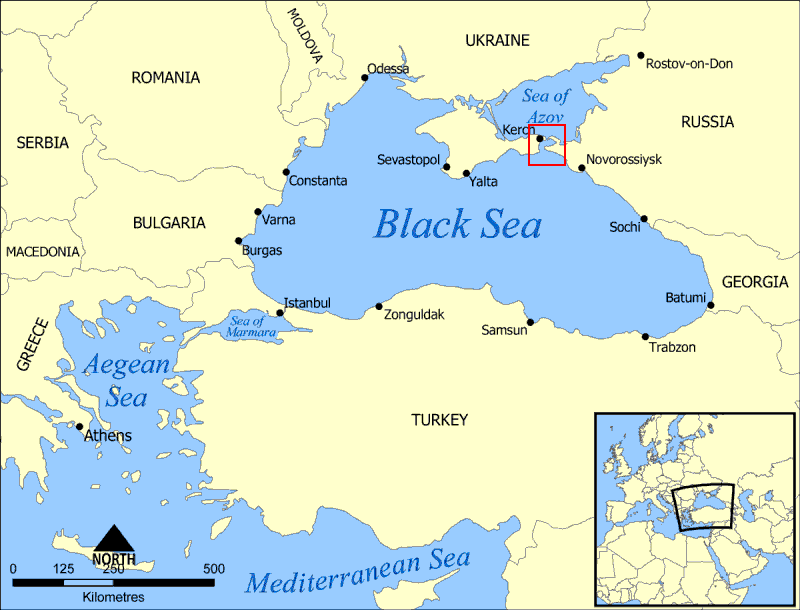 It is a Russian absolute that the Black Sea must continue to be controlled by Russia in all strategically significant ways, regardless of whether they have any legal jurisdiction over the areas they covet or not. This plays directly into their historical strategic goals of securing access to the ocean and creating buffer zones around as much of their territory as possible. In this case, they are — and have been for a long time — trying to create legal jurisdiction for themselves by forcing an agreement of some sort with Ukraine. 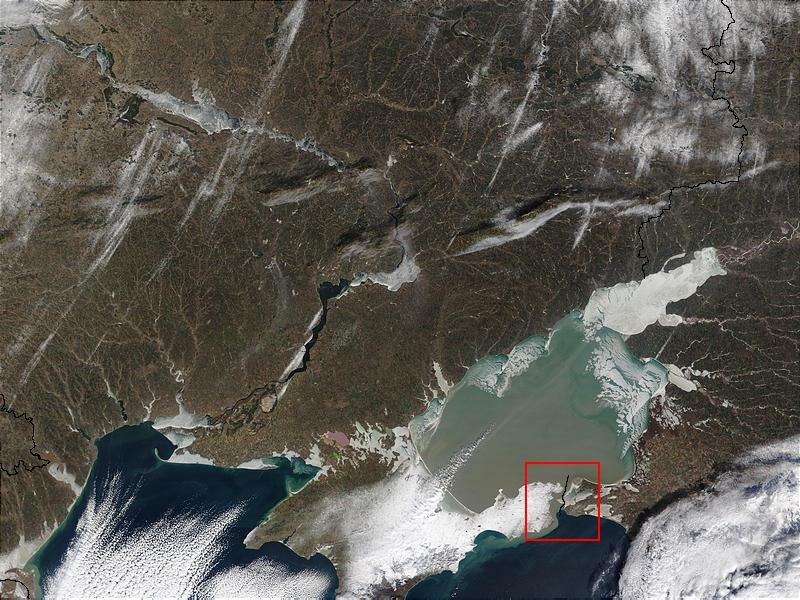 Kerch Strait. The black line here denotes the most commonly recognized international border, which does not satisfy Russian interests. What Ukraine is trying to do by making these very public statements about Russia’s power plays around the Kerch is draw NATO’s attention to the strategic importance of the area to improve their image in the sight of NATO. NATO is, after all, basically an anti-Russian alliance and anything as significant as the Kerch that Ukraine could bring to the table is worth noting. That Ukraine would be accepted or, at this point even desire memebership, is in question, but deals can be brokered with Ukraine outside of NATO membership which would help secure its independence while giving strategic access to the Sea of Azov in return. This entry was posted on Thursday, November 20th, 2008 at 23:03 and is filed under Politics / Geopolitics. You can follow any responses to this entry through the RSS 2.0 feed. You can leave a response, or trackback from your own site.